It wasn’t until 221 BC, when Qín Shǐ Huángdì , conquered the other states and united the land, that China had it’s first imperial dynasty. In the West, the first Roman emperor came 200 years later in 27 BC, all seven of the Great Wonders had already been built, and Greek influence on Europe, Africa, and Asia were at its peek (Hellenistic Period). Qín Shǐ Huángdì was important because he was the one who invented the imperial system which was continued for the next two thousand years. His success as a leader in the battlefield and of the commoners brought an end to a fractured China, uniting the land under the Qin Dynasty. 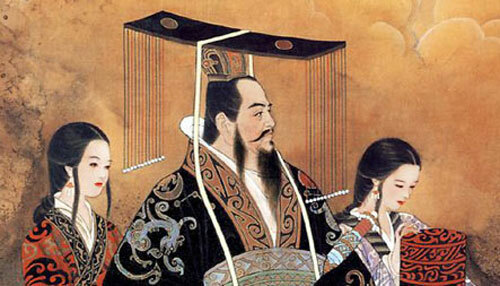 In fact, “huángdì ” means “emperor” and the title was adopted by Chinese leaders for the next two millennia. In addition, he reformed and standardized many economic and political practices in the controlled territory. The Qin Dynasty was also responsible for the creation of the Great Wall of China. While everyone is familiar with the Terracotta Warriors, not many are familiar with the man behind the construction of them. The statues were built with the idea that they would protect Qín Shǐ Huángdì while resting in his mausoleum. The burial of this ruler also became a standard for other deceased leaders, with burial mounds constructed similarly to Qín Shǐ Huángdì’s. His was arguably the most decadent of all mausoleums, as it was a city in of itself, complete with fortresses, several sets of city walls, and numerous burial sites. haha Hopefully you can convince her. The mound itself is impressively tall. There used to be stairs leading to the peak, including a monument at the top, but it was abandoned within the last couple decades. The mound is not well maintained. I can’t find any sources that explains why, but I believe it is because of the high traces of mercury found there. No stairs that I could see now. Wasn’t Qin Shih Huangdi also the person who ordered all previous histories to be burnt so that all future histories of China would start with him? The whole tomb complex looks enough like the work of a megalomaniac that this story could well be correct. The controversy here is that the primary source of information on the book burning and “scholar slaying” are the accounts of a historian from the following dynasty (Han Dynasty). His name was Sima Qian. Because he was from the preceding dynasty, the purpose of his writings was to make the Han Dynasty (comprised of the Han family and clan) shine brighter than the Qin Dynasty. I think until there are more primary sources, modern historians will continue to question the validity of this particular accusation. These events are the reason why Mao Zedong admired Qín Shǐ Huángdì so much, but it might turn out that these events didn’t even occur, at least as severe as it has come to be known.